Azerbaijan Airlines has advised that it will resume flights between Baku and Geneva from 30th October this year. The flights are to be part of the carriers joint charter programme for the classic transportation scheme, which includes free baggage and hand luggage and meals on board. The flights depart from terminal 1 of Heydar Aliyev International Airport. 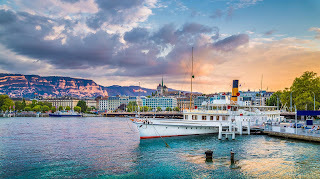 Geneva, the second most populous and the largest city in Switzerland is a popular tourist and business destination. It is home to one of the worlds leading banking centres along with a significant scientific hub. The city is located between the mountains of Jura and the Alps and as such is a gateway to many tourist destinations. The pearl of the city is its Lake Leman with a beautiful lakefront and luxurious hotels around that offer year-round hospitality. The Azerbaijan Airlines flights, J2-5009 / J2-5010 will operate twice a week on Tuesdays and Fridays with Airbus A319 aircraft. The twinjet offers improved comfort seats in three service classes - VIP Club, Business Class and Economy Class. The airline has recently announced plans to introduce a number of other international routes to various destinations, including - Amman, Amsterdam, Bangkok, Cairo, Delhi, Karachi, Kuala Lumpur, Rome, Seoul and Vienna. More international destinations could also be started as the Baku based carrier seeks to dramatically increase its international network and presence.